Marco on Christchurch no More Risky than Wellington. But Does That Make a Good News Story? This is the first post of a 3-4 part series on the Canterbury Earthquake. When I was contemplating a name for this blog a few weeks ago, I wanted something that would convey the following: with planning, preparation, community support, and perhaps a bit of luck, it is possible to come through a major natural disaster, without major loss of life, and with the resiliency to build again, better than before. Little did I know that Christchurch and the smaller communities of central Canterbury would be tested this last Saturday, with the most damaging earthquake since 1931 in Napier. So how has Canterbury coped with this latest disaster? Remarkably well, it would appear. But there are lessons to be learned. Saturday morning’s earthquake in Canterbury had many similarities to the January 2010 earthquake that struck Haiti. Both events occurred at shallow depth (~10-13km), with a magnitude of around 7, near major population centres. 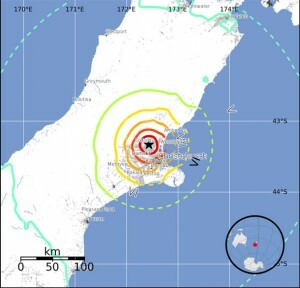 Canterbury’s earthquake was centered about 40 km west of Christchurch, and Haiti’s approximately 25 km west of the capital city of Port-au-Prince. The Mercalli Intensity Scale is a measure of Peak Ground Acceleration (PGA), which can exceed 1g in the most severe earthquakes. When the upward forces exerted by an earthquake exceed the gravitational force that normally keeps things grounded, structures, cars and people can get tossed into the air. The Haitian earthquake produced maximum ground shaking intensities of around MM X, with MM IX producing most of the damage in Port-au-Prince. Similarly, early indications from the Canterbury event suggest maximum ground shaking intensities of around MM IX, with some areas possibly experiencing MM X. In both cases the earthquake was centered on land, so there was no accompanying tsunami, although there may have been a localized tsunami caused by a submarine landslide during the Haiti event. Clearly, the two earthquakes must have had similar destructive power. So why, incredibly, was no one killed in Canterbury, while 230,000 people lost their lives in Haiti? Learning from past earthquakes (especially the magnitude 7.8 Napier earthquake in 1931), New Zealand has implemented stringent building codes. Modern homes are generally timber-frame construction, which flex and absorb the energy of an earthquake. Modern commercial and office buildings are generally constructed with isolated foundations, while many historic buildings have been retrofitted with earthquake dampening devices. 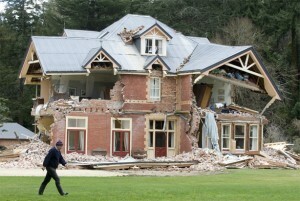 New Zealand is now a world leader in earthquake engineering. Still, there was significant damage in Christchurch, most often to older un-reinforced brick structures, and in areas where liquefaction amplified the ground shaking. And of course, there was major damage to the water and sewerage infrastructure, and disruptions to power supply and transportation networks. The rebuilding cost in Canterbury is currently estimated at over 2 billion (NZ) dollars, compared to over 20 billion dollars for the rebuilding efforts in Haiti. Haiti is one of the poorest countries in the world, and does not benefit from stringent building codes. Construction practices are substandard and earthquake-proof buildings are few. An estimated 250,000 residences were destroyed or severely damaged in Haiti, leaving nearly 1 million people homeless. Even such important buildings as the Presidential Palace and National Assembly did not withstand the severity of the shaking. The collapse of buildings in Haiti led to tens of thousands of people being buried under rubble, or trapped inside unsafe structures. Essential services were decimated. Infrastructure vital to the disaster response was severely damaged, meaning that people could not get the help that they needed in time. The loss of hospitals, major roads, rail links, harbours, and communication networks severely hampered rescue and relief efforts. Without sufficient aid, thirst, famine, looting, and eventually disease took a terrible toll. The relatively small amount of damage in Christchurch (at least compared to Haiti) allowed emergency services to mobilize and respond quickly to the earthquake. Hospitals remained operational throughout. Some essential services were damaged, but the Christchurch City Council responded quickly to water and sewerage disruptions, while electricity and communications providers worked effectively to get their systems back online. Most of Christchurch already has running water, working sewers, electricity and communications restored. This is a tribute to the preparation of the region, and reflects New Zealand’s strong commitment to disaster planning and preparedness. However, it must be acknowledged that luck played a part here as well. If the Canterbury earthquake had occurred at 4:53 in the afternoon, as it did in Haiti, the number of deaths and serious injuries would surely be much higher. People may have been crushed or trapped by collapsing buildings, chimneys and brick facades. Traffic accidents would have occurred all over the city, as traffic lights stopped working, fissures opened up in road surfaces, and various structures collapsed onto busy streets. Canterbrians can be proud of how their region and communities have coped so far with this disaster. But we must not lapse into complacency. We have the best possible scenario here; a major disaster, but with minimal impact, that we can learn from, in order to better prepare ourselves for the next one. As seen in Haiti, it could have been so much worse. And let us not forget, the Alpine Fault is still there, and the elastic band is stretching a bit further each day, storing up energy. Good stuff. Your comparison of Canterbury vs Haiti makes a very strong point. Good building standards = damage of $2 billion and no lives lost. Poor building standards = damage of $20 billion and 230,000 lives lost. Even a poor country should build well, because the alternative is so horrendously costly. I’m a little worried about comments Minister for (newly created) Earthquake Reconstruction, Gerry Brownlee made this morning on Radio NZ about his role is to fast track re-building of the city with power to bypass building regulations and red-tape. John Key also said they chose Gerry because they needed someone who can “bang bureaucrat heads together” if needed. I hope the enthusiasm for speed doesn’t result in the very standards that helped minimize the damage, being lowered or ignored. Also a slight difference in population density as well would be a contributing factor that is not addressed in this piece. In addition to the 1931 earthquake – early NZ settlers had experience of the 1855 earthquake right as the first parts of Wellington was being laid out. The timing of which could not have been more perfect for Colonial New Zealand town development and the use of setbacks, and minimum road width’s. 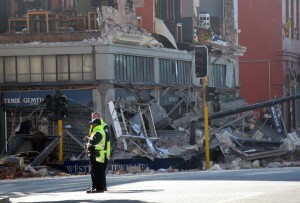 Christchurch got lucky, the worst most of the shaking happened well away from the city. According the USGS, shaking in Christchurch proper only measured between a MM V-VI on the Mercalli scale. MM VIII was measured in the middle of Port-Au-Prince itself. In the Northridge and Kobe Earthquakes, you had comparable earthquakes striking in populated with strict codes areas causing $20B+ and $100B+ respectively. There was also a 2 orders of magnitude difference in fatalities. Supposedly in Haiti, the engineers there trained in France, so the building codes they used did have seismic provisions. This is why presumably well build buildings like the National Palace and UN mission headquarters were so badly damaged. I agree with Blair about the population density. It can also be noted that we don’t have thousands of people living in highrise buildings here. Right now that I’m talking to you now, I’m checking out my children and also grandchildren right here with me. to help my father shoot fundraising video footage for the Haitian People’s Assistance Project. My time in Haiti was hard psychologically or mentally. This was the blog of natural hazards expert Dr Jesse Dykstra who spent his time thinking about earthquakes and volcanoes. It has been archived but the posts remain for your reading pleasure, with the occasional guest post popping up.